It turns out that the Devil is much less scary if you can punch him in the face and chainsaw his legs off. We all know that Doom made the FPS super-popular, but acting as a digital psychotherapist is probably one of its lesser-known claims to fame. In Issue 272 of The Escapist, Ryan Smith talks about how the seminal shooter helped him deal with a literal fear of demons drummed into him by an evangelical Christian church. Two doors burst open and a pair of impossibly muscled creatures emerges with equal expressions of pissed-off menace on their minotaur-like faces. My breath catches as I deftly shift my mouse to the right, preparing to fire my chaingun in righteous self-defense. Through a combination of a well-timed strafe and dumping dozens of rounds into the maws of the red-skinned beasts, I conquer the level and walk triumphantly towards a platform engraved with a pentagram. In the mid 1990s, the first person shooter Doom was arguably the most frightening experience a videogamer could have. For me, however, a shy youth raised in a church where something called "spiritual warfare" was a major part of our Sunday School education, the act of battling demons as a nameless space marine with an affinity for large weapons and later as a warrior in the Demon-centric action roleplaying game Diablo was an entirely therapeutic experience in helping me overcome my fear of real devils and demons. The Bible says "Resist the devil and he will flee from you," and Doom and Diablo gave Smith an effective, if unusual, way of resisting. 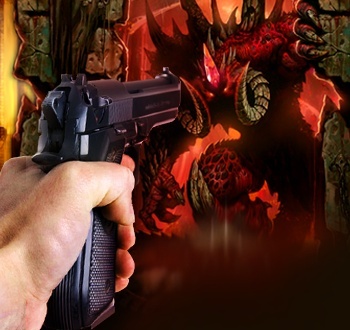 You can read more about the cathartic effects of videogames in Smith's article, "How to Shoot Real Demons"